. . . the suffix of שִׁירֹה is the suffix of the object: a hymn in praise of Him, prayer (viz., praiseful prayer, Hab. 3:1) to the God of his life (cf. Sir. 23:4), i.e., who is his life, and will not suffer him to come under the dominion of death. This meaning of this term appears consistent with observations from Rashi and the Masoretes, who provide insight into the significance of this term. 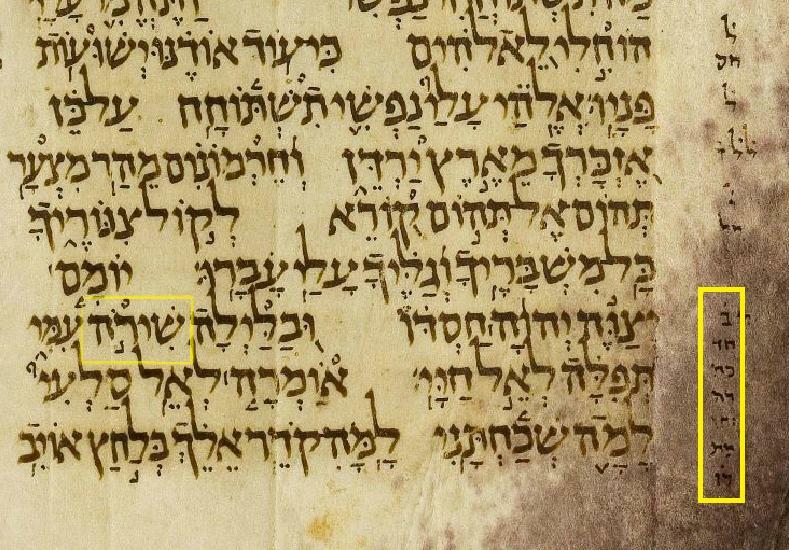 For example, the margin notes found in both the Masoretic Text in the Aleppo Codex and the Leningrad Codex connect this word with the word in 1 Ki 5:12; that is, in the margin of the Leningrad Codex there is a note to continue to view the written term as “שירה,” but when reciting aloud to use the term “שירו.” (The literal meaning of “שירו” would be “his song” when aligned with 1 Ki 5:12.) The Masoretes made the note that these two passages are the only two terms in Scripture that are to be understood with the same meaning in this way. However, as already noted in another posting, Rashi made a correct observation from Midrash Aggadah that this term has a double-entendre based on the reference to ‘and Israel dwelt’ (וּשרָא) found in the Aramaic of 2 Sam 17:26 in the Targum Jonathan to the Prophets. The Aggadah provides for the idea that Torah study occurs in day, and comfort occurs at night through praiseful prayer. Rashi appears to have consulted the Babylonian Talmud, which makes the exact same observation of the idea of ‘dwelling’ based on the Targum Aramaic of 1 Ki 5:12. The precise idea is that the study of Torah provides grace from heaven during the day whose “presence” (or praiseful prayer) will fill the night. “And how do we know that it is called heaven? ‘Look down from heaven and see, even from your holy and glorious habitation’ (Is. 63:15). In summary, both the Talmud and Rashi juxtapose the idea of ‘dwelling’ (Targum Aramaic of 2 Sam 17:26 = שרָא) with the ‘praiseful prayer’ in Hebrew (שירה = feminine suffix) based on the homonym between both words in Aramaic and Hebrew, respectively. The study of Torah in the day leads to the comforting divine presence at night through ‘praiseful prayer.’ Finally, the literal idea of ‘his song’ (שירו = masculine suffix according to the Masoretic connection to 1 Ki 5:12) is therefore not contradicted, but is instead amplified and complemented. Contrast the bolded words with the italicized words. עִירׂה, for instance, is the masculine third person possessive of עַיִר (mule). Compare the Aramaic suffix -הּ. For example, in the Aramaic translation (Onkelos) of the verse has לְקַרְתֵּיהּ (admittedly translating the word עִיר rather than עַיִר ). Hebrew also has the suffix in certain cases (e.g. 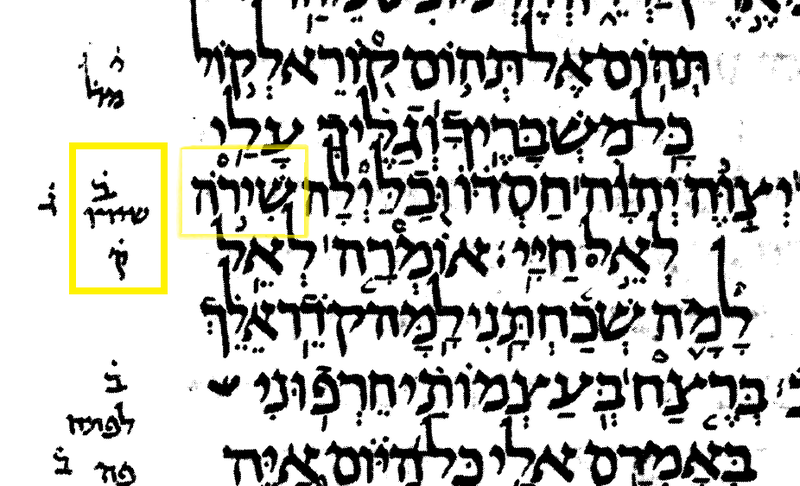 אָחִיהוּ in Micah 7:2 rather than the usual אָחִיו). However, Hebrew (unlike Aramaic) elides ה in most cases. The orthography of שִירׂה (whether "song" or "dwelling") is a remnant of the earlier pronunciation *שירהו which was later pronounced ׂשִׁירו. The Chabad translation, following Rashi, translates שירה as "his resting place". By day, may the Lord command His kindness, and at night, may His resting place be with me, a prayer to the God of my life. Not the answer you're looking for? Browse other questions tagged tehilim-psalms mesorah-tradition grammatical-gender . Why should other nations praise G-d because of His mercy towards us? When or where are Psalms not sung in Judaism?